You can bet someone a steak dinner. You cannot, however, bet someone a quinoa salad dinner. You could, of course. But it doesn't quite sound right, does it? The steak dinner remains the go-to American "fancy" meal. To some, a steak might be commonplace, but for decades, especially out here in the West, a massive cut of high-quality beef served with a couple of simple sides remains a culinary treat. And in Spokane, where cattle are raised within an hour's drive, the steak still holds a special spot in the fine-dining world, and they're good enough to splurge on. Dropping a few hours of wages on a slab of beef might seem outrageous, but we've been doing that for generations. A steak is perhaps one of the original indulgences of the American West. 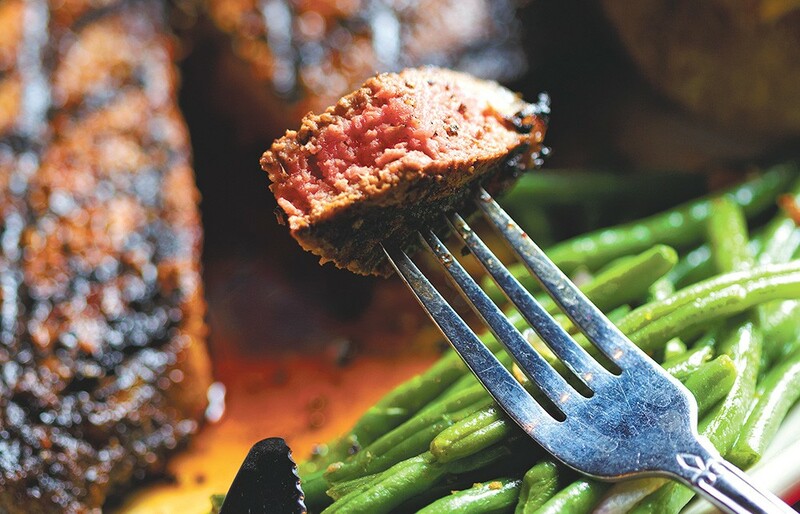 "In my mind, a big, thick steak gives the bite, the flavor and the feeling of indulgence," says Bill Alles, the owner of Churchill's Steakhouse, which opened in downtown Spokane in 2007 and quickly became one of the region's most renowned steakhouses. Serving only USDA prime meats painstakingly selected from Midwest farms, Churchill's steaks run as much as $59. All are big enough for leftovers — and more. Thick, massive cuts, as Alles explains, are part of the allure of a fine steak. "There's something in the back of one's mind about the big grilled steak that will make it an American institution for years and years to come," he says. The fine-dining world has shifted in the past decade to the point where the old-school steakhouse and its rustic trappings aren't what some would consider when heading out for an indulgent meal. Compared to chicken and pork, beef sales are down over the past few years as diners and home cooks try their hand at different cuisines that have become more and more common. That said, the beef industry locally is moving along just fine. If you get a steak from another Inland Northwest favorite, the Wolf Creek Lodge in Spokane, or its sister restaurant, the Wolf Lodge Inn outside of Coeur d'Alene, it came from Double R Ranch in Loomis, a Washington town just south of the Canadian border. The savory taste a steak-lover lusts after starts out on those plains, long before the cow ever becomes meat. And the process might help you understand some of the prices on these items. The porterhouse steak pictured here was cut from a cow grown at Double R, where the animal's nutrition and care is carefully monitored. Terry Reynolds, the company's director of sales, says it doesn't matter how great a chef is, the steak won't turn out great if the animal wasn't cared for properly. "We are watching it all the way through. Animal welfare is critically important in this business. Low-stress animals create a high-quality product," says Reynolds. This porterhouse is one of the Wolf Lodge's most popular steaks and rings in at $53. Their menu also features seafood and chicken items, but steaks reign supreme here. If you go to the original Wolf Lodge Inn, on I-90 just a few miles east of Coeur d'Alene, the menu is basically just steaks, and the interior is far more cowboy. It's simple, but that's part of the joy of a steak dinner.